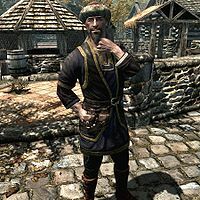 Bolli is a Nord citizen who lives in his house in Riften, and works at the Riften Fishery. He owns the fishery, and has a charitable nature, giving away much of his wealth. He is married to Nivenor. He wakes up at 9am, then eats breakfast in his house for an hour. Then, at 10am, he heads outside and browses the market stalls for five hours. After that, at 3pm, he heads to the fishery to work in his office for five hours. After work, he heads to the Bee and Barb at 8pm to eat dinner. He stays there, eating and drinking, for seven hours, until he finally heads home at 3am to go to sleep. He wears some merchant clothes, a pair of boots, and a hat. He wields a leveled dagger (up to elven quality), and carries a leveled gem, a fishery key, a house key, and a selection of upper-class items and gold. He's a fish-oriented man, greeting you with, "New in town, eh? Here for the fishing I'd guess." or "There's nothing like fishing on Lake Honrich, you should try it sometime." or "If you're hungry, Marise sells fresh fish... caught by yours truly." If you ask him the obvious question of whether he is a fisherman, he will confirm, saying, "Only the best in all of Riften! I own Riften Fishery. Started out with a single fishing pole and now I have an entire building and two boats to my name. Not bad for a middle-aged Nord, eh? Too bad I haven't had the same success helping this city shed its poverty. Nivenor thinks I'm wasting my time trying, but I disagree." When you ask him about Nivenor, he'll tell you about her, saying, "Nivenor is my wife. How I was ever able to meet such a gorgeous creature is one of life's mysteries. We're... at odds about my charity. She thinks the people in this town have become lazy and expecting a handout. I try to include her in my lessons from Maramal over at the Temple of Mara, but she prefers to shop instead. Different strokes, eh?" When you notice his charitable nature, he'll say, "Yes, I suppose someone has to be around here. Have you seen the condition of this sorry excuse for a city? Beggars roam the streets, crime runs rampant and the threat of war is driving away business. The paltry amount of coin that I place in the charity box at the temple is the least I can do to help." If you're handing out pamphlets for the temple, he'll gladly accept one, saying, "Thank you. Blessings of Mara upon you as well." When exiting conversation, he may say, "Remember to give at the temple." When asked who buys his fish, he'll present an offer, saying, "I sell my catch across a good portion of Skyrim... it's worth its weight in gold to me. The only untapped market left is Markarth. However, I just got word that Kleppr at the Silver Blood Inn [sic] might be interested. If you're headed that way, I would appreciate you delivering a purchase agreement for me. You'd be paid, of course." If you tell him you might at some other time, he'll say, Certainly. If you just say you'll do it, he'll be pleased and hand you the purchase agreement, saying, "Good. Kleppr will pay you as soon as you arrive with the letter. Here you are." If you have yet to deliver the letter, he may ask, "Did you get that purchase agreement to Markarth yet?" Once you have delivered the letter to Kleppr, he'll say, "Thanks again for the delivery to Markarth. What can I do for you?" (Persuade) Passed: "Look, it was one night, okay? I think she slipped something in my drink. I haven't even been back to the Bunkhouse since. Just take this damn thing. I never want to see it again." Failed: "Hand what over? I have no idea what you're talking about." (Intimidate) Passed: "Look, it was one night, okay? I think she slipped something in my drink. I haven't even been back to the Bunkhouse since. Just take this damn thing. I never want to see it again." Failed: "Or else what? You don't scare me." Never mind. My mistake. "I should say so." Nivenor: "(Sigh) Yes, as usual. I'll be there." Drifa: "Hello Bolli. How's the fishing?" Bolli: "Bountiful. Although I would like to have anchored a bit closer to Goldenglow Estate." Drifa: "Why didn't you then?" Bolli: "When I got close, the mercenaries Aringoth hired to protect the estate just waved me off. I don't think he wants visitors anymore." Bolli: "(Sigh) Very well. You're lucky Maramal has placed me in a very forgiving mood." Bolli: "Talen my friend, up for some fishing this week?" Talen: "I don't know Bolli. It's getting dangerous outside the walls." Bolli: "Oh come now, what's a dragon or two compared to a day full of fishing!" Talen: "That's not funny, Bolli. People are scared." On the second floor of his house there's a note regarding his marriage. During "Caught Red Handed", when asking Bolli about his relationship with Haelga he will remark that he has never slept with any woman other than his wife Drifa. However, Bolli's wife is Nivenor. This page was last modified on 7 September 2018, at 14:00.